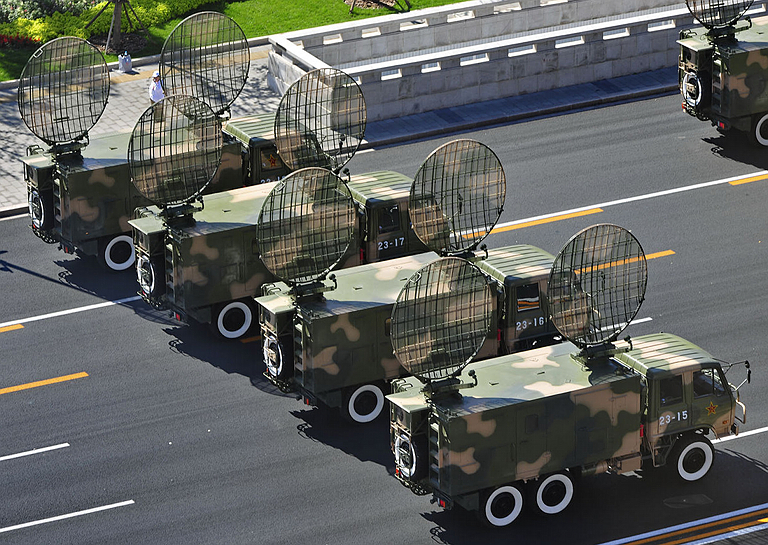 PLA CETC TS-504 tactical digital troposcatter communication system on parade in 2009. 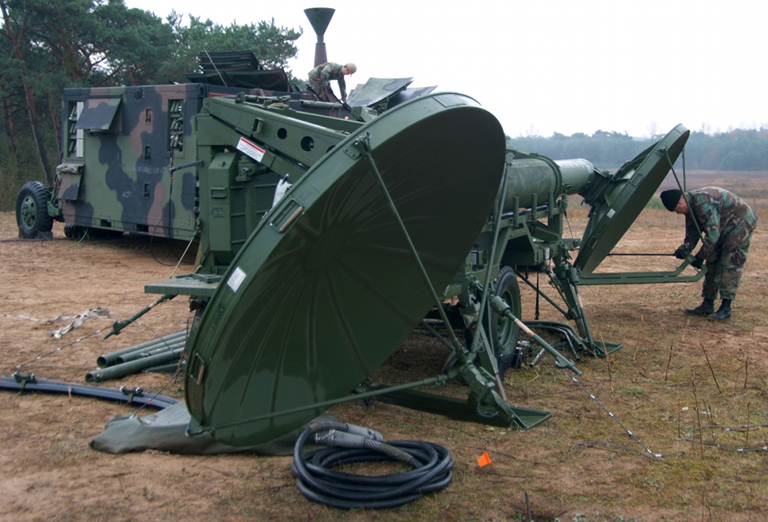 This system has been deployed extensively to support HQ-9 and S-300PMU2 mobile SAM batteries, providing digital connectivity to the fixed IADS C3 network. Range and datarate performance have not been disclosed to date (image Chinese internet). 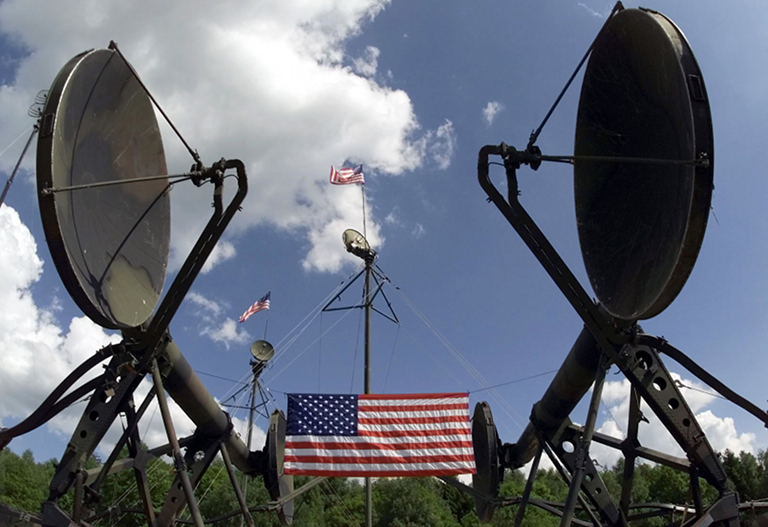 Troposcatter versus conventional line-of-sight microwave relay communications (US Army). 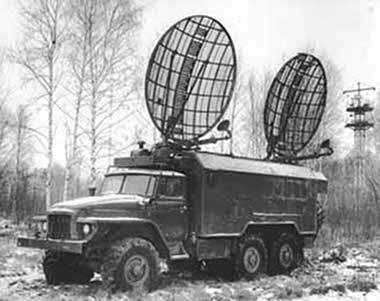 Troposcatter communications systems emerged during the 1950s, during the period of intensive strategic competition between the NATO nations and the Warsaw Pact, prior to the advent of satellite communications. 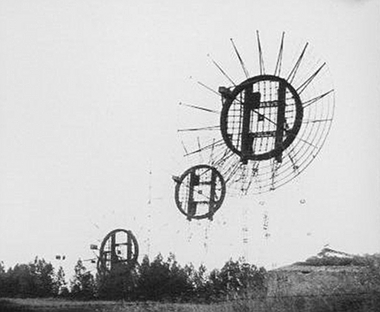 Such systems were extensively deployed by the US and the Soviets, and to a lesser extent by their respective allies, to provide C3 channels typically in sparsely populated areas. The Soviets deployed an extensive network of troposcatter relays through northern Siberia and the Far East, while the US deployed an extensive network along the DEW lines, and through Alaska and the Aleutians. These fixed networks were later supplemented by mobile tactical systems, intended to provide digital trunk communications for manoeuvre land force elements. In technological terms, troposcatter communications are an offshoot of early radar technology, and such systems were constructed using elements of the same technology base, but also exploiting initially technology used in period analogue telephony, and later digital telephony. 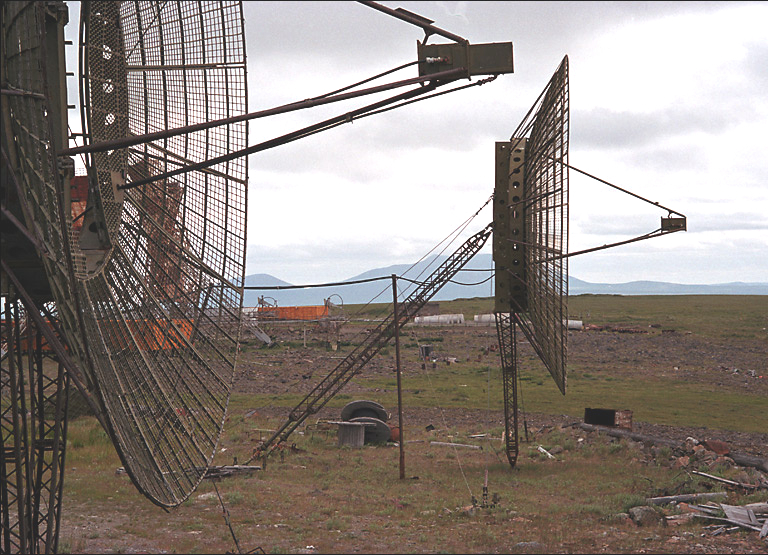 The physics underpinning troposcatter communications are most interesting, and remain the subject of academic research despite the decline of troposcatter networks, mostly replaced by satellite communications links. In a conventional microwave relay communications network, a transmitter must have a direct line of sight to a receiver. Modulated radio-frequency power emitted by the transmitting antenna propagates, with diminishing amplitude following the inverse square law Friis equation, until it impinges on the receiving antenna, where it produces an electrical signal which is amplified and demodulated by the receiver equipment. While refraction due to the gradient in atmospheric refractivity (due to density lapse rate with increasing altitude) can “bend the beam” over the horizon slightly, typically this cannot increase range beyond the line of sight (BLOS) to any significant extent. In a troposcatter system, the beam is bounced off the upper troposphere, providing a true BLOS point to point communications capability. These systems rely on the irregularity of the refractivity gradient at such altitudes, resulting in impinging microwave power being scattered forward in an irregular fashion. In terms of achievable range performance, smaller troposcatter systems are able to repeatably achieve 100 - 150 km ranges between a pair of stations. Larger systems, with 10+ metre antenna diameters and kiloWatt class transmit powers levels, have been reported with ranges of up to 400 km between a pair of stations. 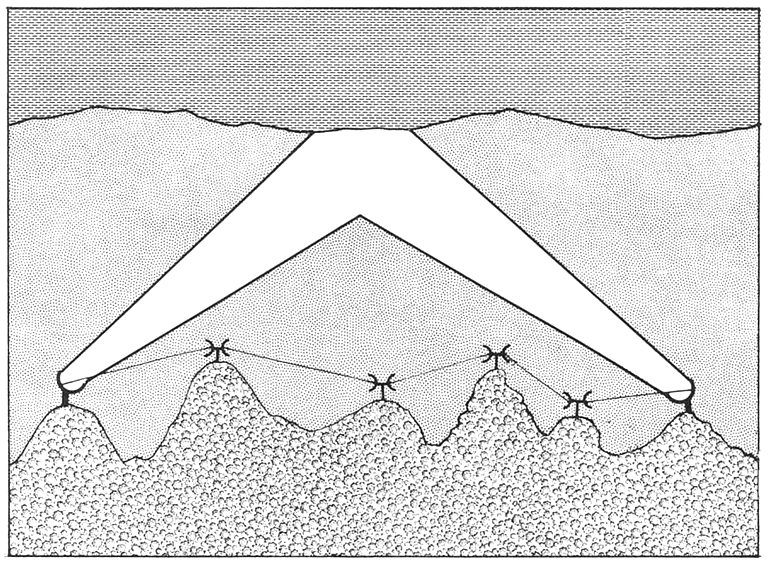 It is this range performance which has underpinned the popularity of troposcatter technology for use in undeveloped or underdeveloped regions, as it permits operation of a microwave channel in terrain where the cost of both deploying and maintaining a conventional microwave relay would be prohibitive. In land warfare contingencies, troposcatter stations deployed by an advancing manoeuvre force permit the maintenance of a chain of relays back to the initial staging area, providing voice and data connectivity, with no dependency on airborne or satellite relays. Achievable channel capacity and thus data rates for troposcatter systems are quite poor in comparison with direct line of sight (LOS) microwave systems operating in the same bands, such as links between aircraft and ground stations. This is for two basic reasons. The first is because the forward scattered power levels are relatively low, compared to inverse square law power levels across the same pathlength in a direct LOS link. The second reason is a byproduct of the irregularities in the scattering mechanisms, and variations in pathlength arising from the propagation path, both resulting in a strongly dispersive propagation medium. As with all dispersive media, this impairs achievable bandwidth for most conventional signal modulation schemes. Where performance data has been published for troposcatter systems, there is a pronounced reduction in achievable data rates with increasing link range, due to the cumulative effects of dispersion and declining power at the receiver. Multipath fading effects due to ground bounce at the receiver will also not contribute to achievable channel capacity. A range of design techniques have been adopted since the introduction of this technology, to reduce the adverse impact of the medium. These include frequency diversity, including the use of adaptive techniques, but also more recently modulation techniques which are better suited to dispersive media have been used, in addition to robust Forward Error Control (FEC) techniques. Recent research suggests that newer modulation techniques, including Coherent Orthogonal Frequency Division Multiplexing (COFDM/OFDM), which is highly resistant to multipath effects, are well suited to such an application (Hu et al). Current state-of-the-art US equipment provides data rates of 8 - 22 Megabits/s at unspecified ranges, operating in the 1.7 - 2.3 GHz and 4.4 - 5 GHz bands, and using conventional Quadrature Phase Shift Keying (QPSK) and FEC techniques, with quad frequency diversity. An example is the US designed and built Comtech troposcatter component of the British Cormorant battlefield network, cited at a data rate of 8 Megabits/s to a range of up to 300 km. While troposcatter systems no longer occupy the prominent position they did during the early Cold War period, being used primarily in niche applications, this technology may yet see a revival as orbital and spectral congestion place increasing constraints on satellite systems. With Moore's Law providing ever cheaper computational power over time, the cost penalties of using modulation and coding techniques capable of overcoming highly dispersive and time variant propagation media will decline. Whether this results in a major renaissance for troposcatter remains to be seen. Source: V.V. Serov, A.M. Sechenikh, MNIRTI Troposcatter Systems, Informost Journal, No.4 2006. Ukrainian built MNIRTI R-423-1 Brig-1 troposcatter system (Ukrspetsexport). MNIRTI developed and then in 1981 deployed the R-423-1 Brig-1 centimetric band mobile tactical troposcatter system. The system provides a 2048 kilobits/s capability to 150 km range, or a 64 kilobit/s capability to 230 km range. The system operates in two S-band frequency ranges at 4.435 - 4.555 GHz and 4.630 - 4.750 GHz, using 220 subchannels, with H-pol., at a transmitter output of 1.5 kiloWatts. Digital interfaces are provided at 48 kilobits/s, 480 kilobits/s and 2048 kilobits/s. The most recent variant is the R-423-2A intended as a replacement for the R-412 Torf troposcatter system. The -2A operates in the same bands as the -1 variant. Cited transmitter power is 220 Watts, and receiver NF at 7 dB. The system is deployed on a KAMAZ-4310 truck, using a towed 2х8-Т400-1ВПС electrical generator. Cited data rate and range performance figures for the R-423-2A are full duplex 230 km at 1.2 kilobits/s, 210 km at 2.4 kilobits/s, 190 km at 4.8 kilobits/s, 170 km at 9.6 kilobits/s, 130 km at 48 kilobits/s, 90 km at 240 kilobits/s, and half duplex 140 km at 480 kilobits/s. The R-423-1 series remains in production in the Ukraine and is offered for export, in mobile and static relocatable configurations. Above: 1980s built R-423-1 Brig-1 tactical troposcatter system on the Ural 375D 6 x 6 truck, with the power generator and support equipment carried by a KAMAZ-4310 truck which is not depicted. Left: a contemporary R-423AMK shelter mounted relocatable tactical troposcatter system. The R-444 Eshelon and R-444-7,5 Echelon D UHF band digital troposcatter relay stations were developed and deployed between 1981 and 1984. These designs provide 1 Megabit/s capability to 130 - 150 km, or 48 kilobits/s to 230 km. 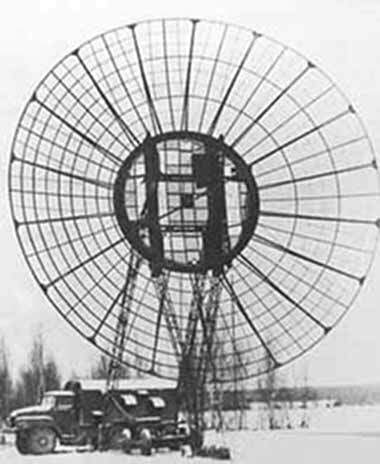 MNIRTI developed the R-420 Atlet D series in 1975 as a replacement for the widely used R-408 and R-410 systems, retaining the same parabolic antenna configuration. The station electronics were significantly improved in comparison with the 1960s designs. The R-420 receiver NF was improved by 3 dB, phaselocked oscillators were employed to drive the demodulators, and polarisation diversity was employed to improve performance. The system employed paired Atlet AS-16 16 metre diameter antennas providing a 35 dB gain. Range per relay hop was improved to 350 to 400 km. The P-417 Baget 1 digital relay system was deployed in 1980, after protracted research which began in 1966. The system provides either 60 digital voice channels, or 480 kilobits/sec of data. To improve performance the design employs 16 channel frequency diversity. Range per hop in a relay was 200 km, with up to 10 hops permitted for a relay chain length of 2,000 km. 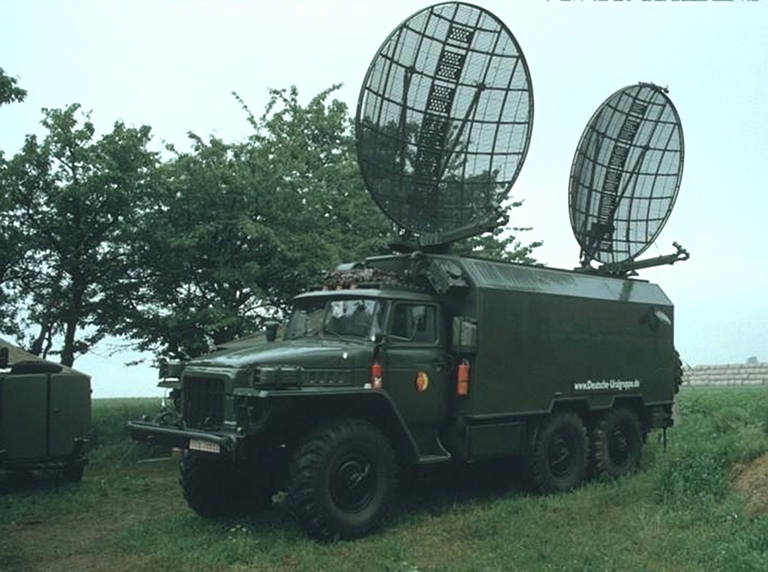 The static R-417S variant formed the backbone of the Warsaw Pact “Bars” (Leopard) troposcatter relay network, comprising no less than 26 sites, with 54 R-417S relay stations and an aggregate span distance of ~5,000 km. Two “Bars” spans employed the longer ranging R-420S systems. The network, which spanned the territories of the USSR, Poland, East Germany, Czechoslovakia, Hungary and Bulgaria, was commissioned in 1987 and fell into disuse three years later with the collapse of the Soviet regime. 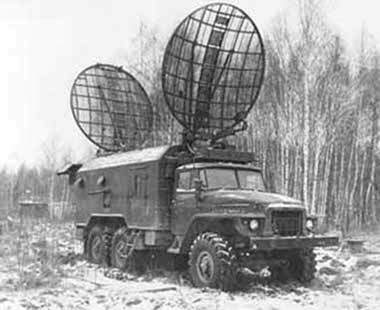 An R-412A Torf-A tactical troposcatter relay of the DDR NVA on a Ural-375 truck. R-412S Torf-S static variant for fixed site applications, based on the R-412F, but using a 20 metre Sosna-18S mast system. The system transmits at 200 Watts or 400 Watts in the S-band. Frequency diversity is employed, with subchannels spaced at 192 MHz. Cited data rates are 1.2, 4.8, 12 or 48 kiloBaud. A Russian Army R-412A Torf-A tactical troposcatter relay carried on a KAMAZ-4310. 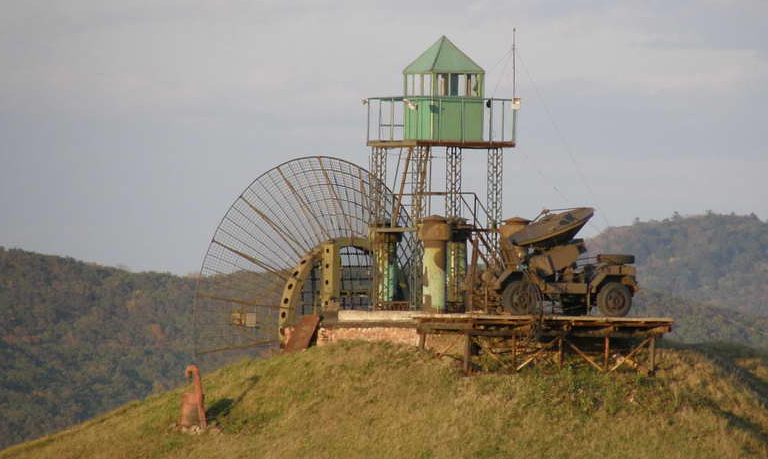 A disused R-410 relay system antenna installation in the Amur region (via Russian internet). The R-410 supplanted the R-408 series in production, from 1967. 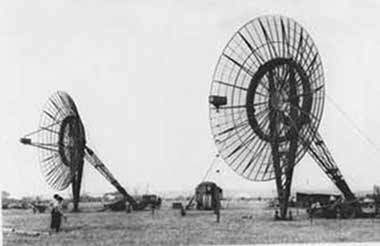 It was built in three main variants with 5.5 metre, 7.5 metre and 10 metre diameter parabolic antennas. Range varied between 150 and 250 km, and a relay system could be constructed with up to 10 hops. The system provided 24 full duplex analogue telephone voice channels. 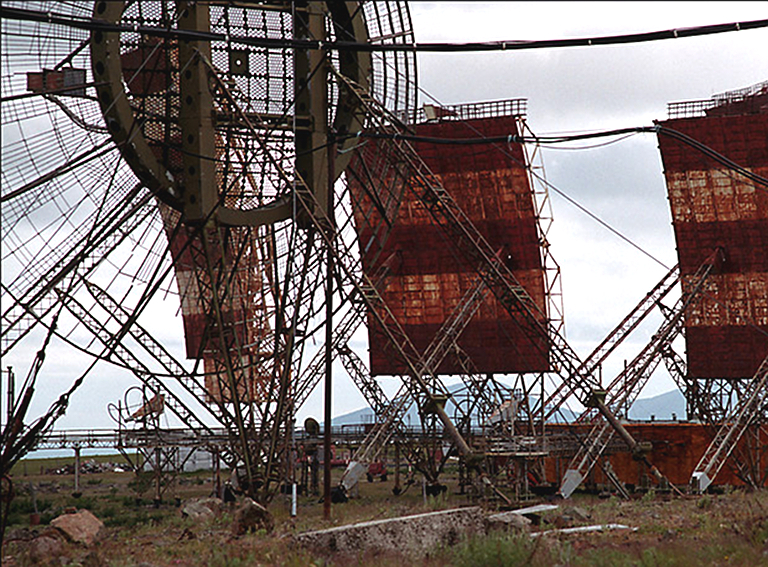 A disused and decaying R-408 system antenna installation in Russia (via Russian internet). 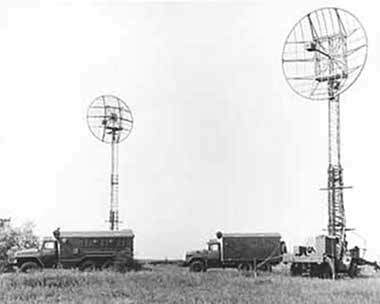 The UHF-band R-408 Baklan (Cormorant) was developed in 1962 by MNIRTI to provide a static multihop troposcatter relay capability for use in sparsely populated areas. The designed was enhanced in 1964 and continued in production as the R-408M. The R-408 is readily identified by the 10 metre parabolic antenna diameter. The system delivered a range of 120 - 150 km between stations. The R-408 provided 12 analogue telephone channels using Frequency Division Multiplexing. 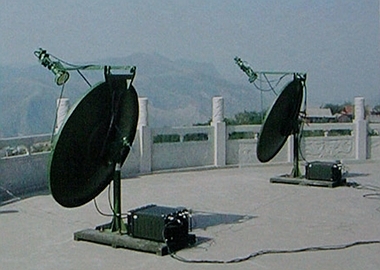 Deployed TS-504 antenna system (image Chinese internet). The CETC technical brochure for the TS-504 states no more than the obvious, which is that the system is a Chinese analogue to the Soviet R-423 series. The system was prominently displayed during the 2009 military parade, and is known to have been exported to Pakistan. 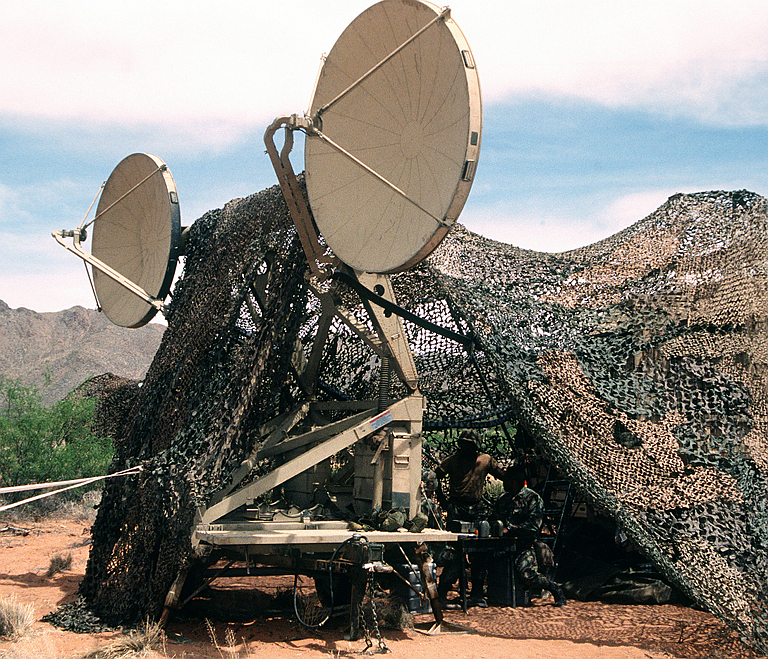 The TS-504 is frequently employed to provide digital IADS connectivity to mobile HQ-9 and S-300PMU2 / SA-20B SAM batteries. 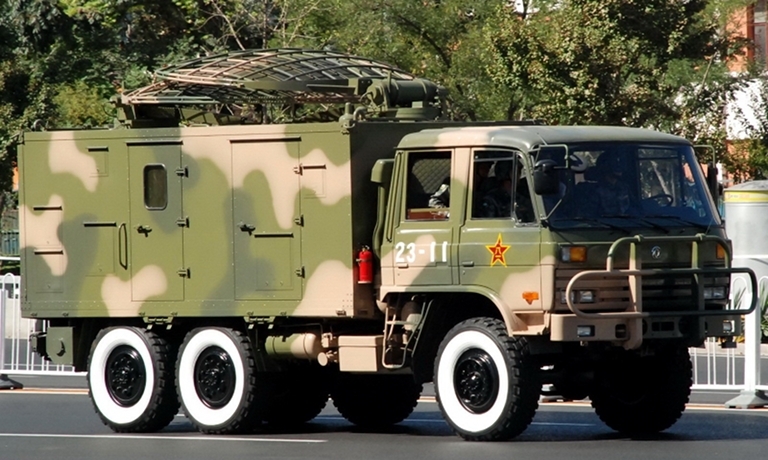 Some claims have emerged that the PLA's troposcatter systems were supplied by the Ukraine. 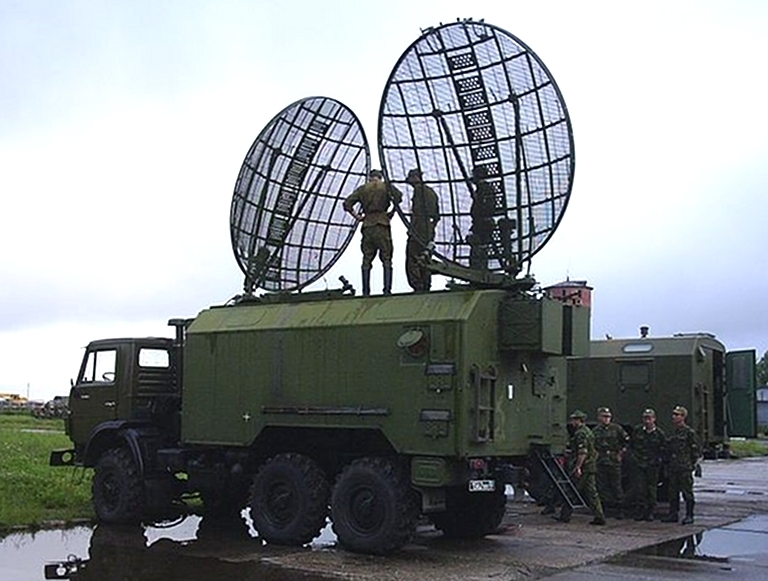 The distinctly different antenna designs on the Ukrainian R-423-1 variants and TS-504 would suggest otherwise. Chinese researchers have published a respectable number of research journal publications on troposcatter communications, including papers describing the use of relatively advanced modulation techniques. 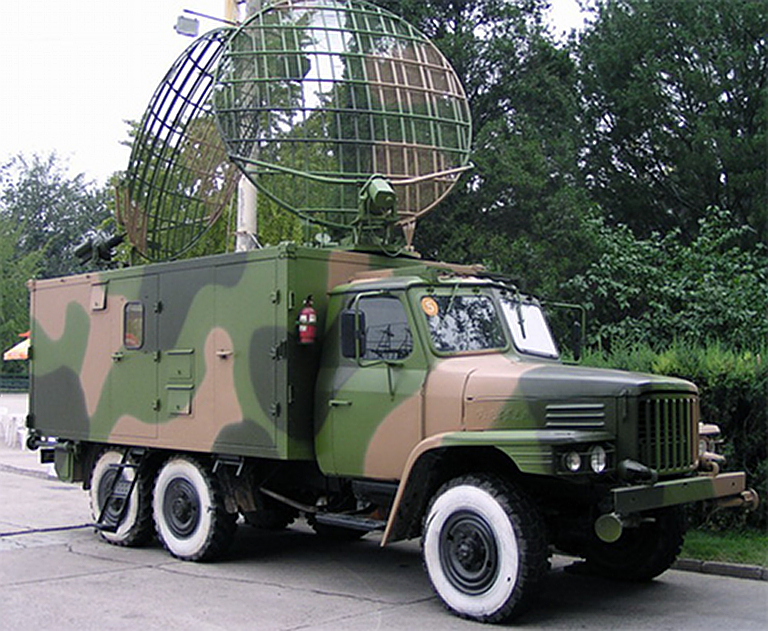 Stowed TS-504 (image Chinese internet). Detail of stowed TS-504 antenna suite (image Chinese internet). 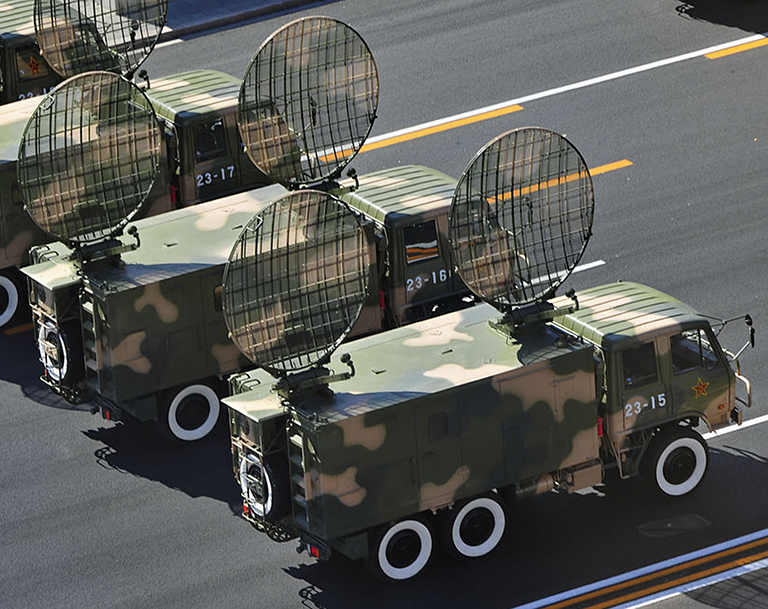 The PLA have used the TS-504 extensively to support high mobility S-300PMU2 Favorit / SA-20B Gargoyle and HQ-9 SAM batteries with IADS connectivity. Depicted a 96L6 radar, 5P85TE2 TEL with a BAZ-69022 tractor, and a TS-504. Datalink interfaces between these systems have not been disclosed to date (Chinese internet). The CETC TS-510 / GS-510 Troposcatter Communication System is a short range tactical design which is available in a static relocatable GS-510 variant, and a fully mobile TS-510 variant. To date no official figures have been released detailing range and data rate performance. 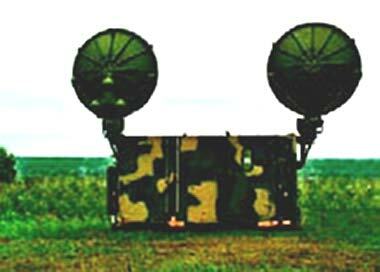 Variants of the AN/TRC-170 have been the primary tactical troposcatter system used by US forces for two decades. The system has proven highly effective in supporting ground force manoeuvre elements in conflicts since 1990. The system is now considered legacy equipment, but continues in operation with block upgrades applied. The performance of the system is cited at data rates of 4 Megabits/s up to 16 Megabits/s with an upgrade kit installed. AN/TRC-170 being deployed (US DoD). 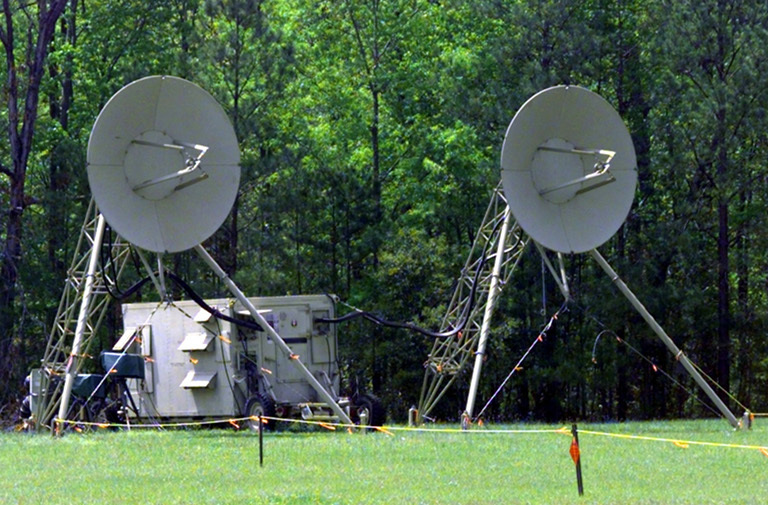 An AN/TRC-170(V) tactical digital tropospheric scatter radio site of the 240th Combat Communications Squadron, South Carolina Air National Guard, McEntire Air National Guard Base, South Carolina, 10 April 1999 (US DoD). The AN/GRC-201 / AN/TRC-97 systems were replaced by variants of the AN/TRC-170. V.V. Serov, A.M. Sechenikh, MNIRTI Troposcatter Systems, Informost Journal, No.4 2006.